situé dans le centre de Bruges, à seulement 650 mètres de la Grand-Place. place. De nombreux restaurants sont situés à proximité de l'hôtel. 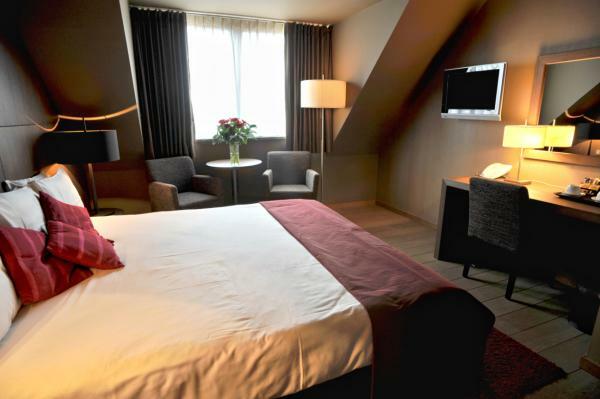 Equipped with all mod cons and pleasantly decorated, the Classic Room is simply great value for money when planning a short or active stay in Bruges. These rooms are mostly located in the part of the hotel facing the garden with pond and are a popular choice amongst couples and single travellers alike. They have an en-suite bathroom and toilet and are well equipped with wi-fi access, satellite television, their own tea and coffee making facilities and a desk. A quality, comfortable bed ensures a good night’s rest and of course our highly praised hot & cold breakfast awaits you in the morning, included in the room rate! Spacious and with trendy decorations and furnishings, the Club designer rooms offer all modern comforts. Belfort Hotels fera tout pour que votre séjour à Bruges soit parfait. Visiter notre page de contact si vous désirez nous envoyer un courriel.